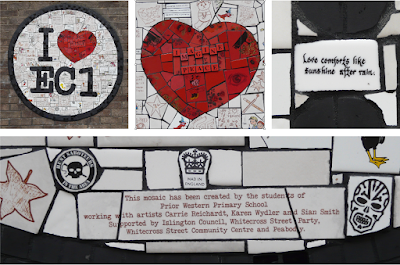 In a back street within the Peabody Estate to the side of Whitecross Street market there is a mosaic on a wall. In a circle it says I (heart) EC1. But look closer and see the messages and drawings within because there are lots of lovely quotes and sentiments there. The caption on it reads: "This mosaic has been created by Western* Primary School working with Carrie Reichardt, Karen Wydler and Sian Smith, supported by Islington Council, Whitecross Street Party, Whitecross Street Community Centre and Peabody". I have produced some cards using my photographs of this artwork. Also see 'Love Love Love' using my adaptations of the sign that currently wraps around the old Angel tube station on Pentonville Road. Or how about a Vinegar Valentine? *Spelling error here: The school is actually called Prior Weston Primary School. Sir William Weston was the last english prior of the Order of St John.